Last Saturday was great! From what I saw, the Garden Tour was a huge success and lots of fun! I met a lot of neighbors and talked to a lot of people about how great co-ops are. I also got some pretty interesting questions about my garden so I thought I'd sum up what I've learned from my first real gardening season. [caption id="" align="alignnone" width="500" caption="crowded? never."] [/caption] Lots of people remarked on how small but full my space was. That's one of my favorite things about my little garden: it's pretty tiny but I've filled it to the gills with plants because I like how they look all packed in and also I couldn't bear to throw out any of my little tomato babies. And I've been pleasantly surprised with how many plants I can actually fit back there (my roommate may tell you otherwise). There have been some casualties, though: I planted my sunflowers and my squash too close together and while the squash fought valiantly, the sunflowers won out and the squash eventually died. But this was when I got smart and only planted half of my squash seeds so I'm going to try again next year. Another thing: tomatoes are not supposed to be this close together: [caption id="" align="alignnone" width="500" caption="they're close buddies"] [/caption] Though I haven't had too many problems with blight or flies (one of my tomato plants had blight so I moved it to my little "alleyway" where it continues to grow somehow) tomato leaves are known for getting various diseases and keeping plants farther apart reduces the risk of moisture around the leaves which is when bacteria and fungus tend to grow. 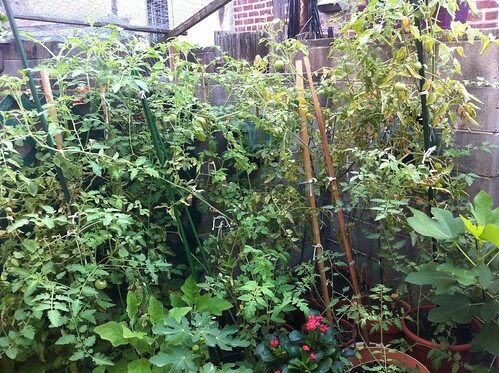 Someone suggested a hanging tomato plant and I might try one or two of those in the future, since spreading out vertically is really my only option (thanks, Garden Tour visitor!) A lot of people asked how I cared for my tomatoes and got them so large. First, these are mostly beefsteak, which is a very large plant on its own. Secondly, I started with good seeds (though next year I am going to buy my seeds locally, perhaps from here, and I'm also going to try saving some seeds from the tomatoes this year) and my seedlings were always pretty strong thanks to my big front window which gets sun all day, and even more sun in the afternoon. I fertilized my tomatoes with some fish emulsion once, in the middle of July. Otherwise the soil was just potting soil with lots of compost (from Bennett Compost) and I would add additional compost every few weeks. If you're using a regular fertilizer (they all will tell you the ratio of N-P-K, which stand for Nitrogen-Phosphorus-Potassium) you want one low in nitogen, high in phosphorus and medium-high in potassium. And that's the extent of my fertilizing knowledge. I've heard that if you're growing tomatoes in a small space you should opt for smaller varieties of tomatoes, like cherry or grape. But I like big tomatoes, so I ignored that. I have learned that big tomatoes need big pots, and some of my pots were too small (or I crowded too many plants into larger pots...a common problem of mine, as you can see.) I think the key is that if you want big tomatoes, you need big pots to give them enough space. 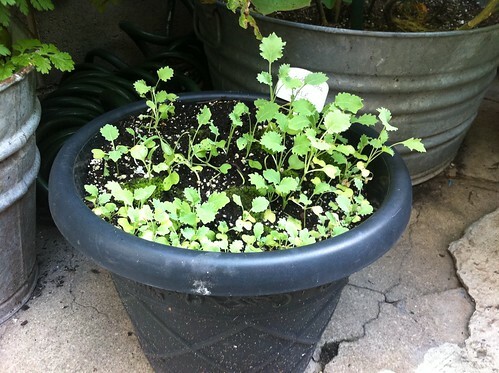 It also makes watering easier because big pots don't dry out as quickly as small ones do. I think this may be the problem with my eggplant also: I threw them all in one pot not realizing how big they would get and I have yet to see an eggplant. I'm not giving up on you yet, though, eggplant. Lots of people asked about the tree. I have a pretty big Japanese maple tree in my backyard that was there when we moved in (I guess "big" is a relative word here.) 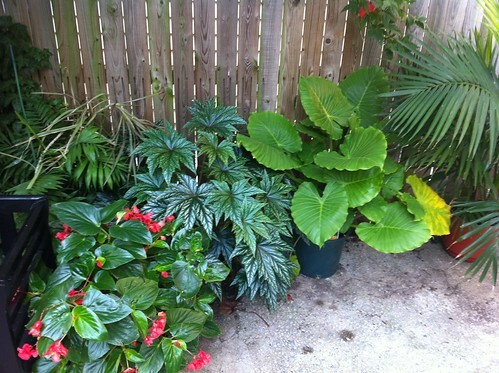 It limits the amount of sun my garden gets, but it also provides a place for me to grow different kinds of plants, those that like shade: [caption id="" align="alignnone" width="500" caption="shade lovers"] [/caption] At first I was kind of annoyed that the tree was taking up all this sun, but then I realized that it was good to have some much-needed shade. 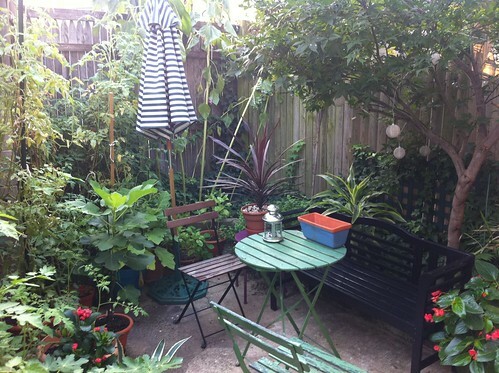 The shade is pretty dappled so I can grow partial-shade plants there, too, which is nice. So thanks for your questions, garden tourers (tourists?)! It was fun to meet people who read this blog (!!) and maybe get some new readers, too. And even though the summer is drawing to a close (and this post reads like a wrap-up post) I am still growing things and writing about them. I've found fall to be a great growing season here - not as horribly hot as the summer but still fairly warm and sunny. My little kale and chard are growing away! 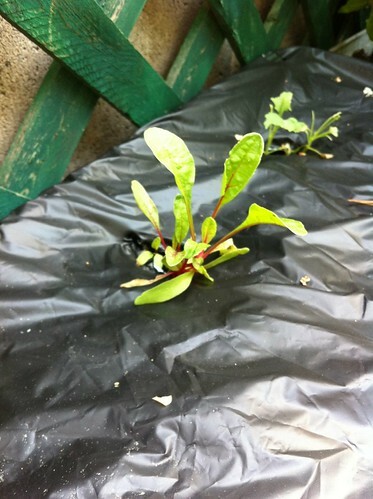 The chard didn't like all that rain but now it seems to be doing better: [caption id="" align="alignnone" width="374" caption="little red stems"] [/caption] and some of the kale got too wet but this pot still seems to be doing fine despite the moss: [caption id="" align="alignnone" width="500" caption="curly ones"] [/caption] So stay tuned for more plants! I'll keep things growing as long as the weather allows. Oh, and this reads like an afterthought but it definitely isn't - I just didn't know where to stick it in other than at the end - but there were some people who deserve a shout out for making this whole thing run a lot more smoothly: my parents, who bought Garden Tour tickets as soon as they heard about it (loyal SPFC blog readers) and came all the way down from Massachusetts for the tour. Once I finally convinced them to leave my house they really enjoyed seeing all the gardens! And thanks to my boyfriend who sat out front the whole time greeting people and brought me some much-needed food. I couldn't have done it without any of you! Sarah DeGiorgis has lived in Philly for five years and is finally starting to feel like a true Philadelphian, though she still detests cheesesteaks. She enjoys reading, watching bad tv, eating and cooking good food and digging in the dirt. Catch up with her continuing efforts to grow food in South Philly by clicking here.